Arthur Owen Francis, a porter, signed up in Toronto on this day in 1916. He was born in Stratford, London, England on February 9th, 1895 and came to Canada on the SS Kensington in 1907 with his parents, John and Emma (née Smee) and four siblings. Their passage was paid by the West Ham Distress Committee, which had been established as part of the British Unemployed Workmen’s Act of 1905. His father was a porter and the family were heading for Deseronto. In 1911 they were living on Foresters’ Island, where John was the caretaker. Francis joined the 92nd Battalion with the regimental number 193595. He was five feet five inches tall, with a dark complexion, grey eyes and dark brown hair. His service record shows that he sailed from Halifax on the RMS Empress of Britain on May 20th, 1916. In August he was assigned to the 92nd Battalion, and a month later was transferred to the 42nd Battalion and left England for France. In August 1917 Francis was granted 14 days of leave in Paris. In September 1917 he was admitted to hospital with gonorrhea and treated for three months in England. He rejoined the 42nd Battalion in France on January 5th, 1918. 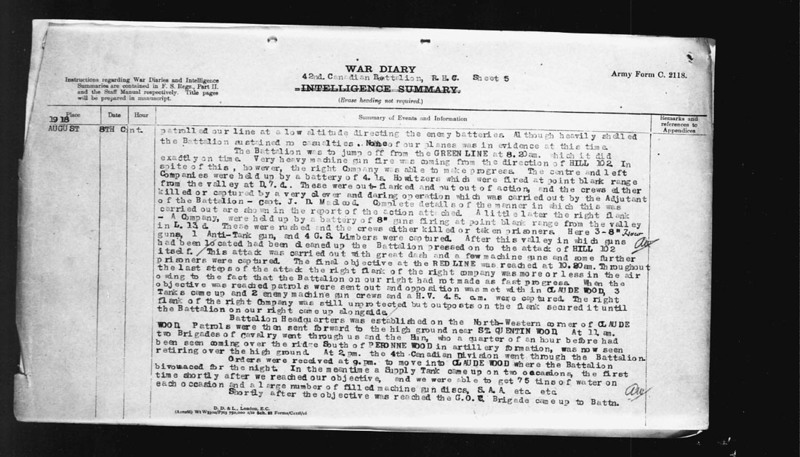 On August 8th the 42nd Battalion was involved in the Battle of Amiens, seeing action at Hill 102, which is described in the Battalion’s war diary (page 1, page 2, page 3). 1918 August 8th CONT. Headquarters in the Wood and the situation was such that we were able to have lunch in the open at which were present besides the Brigadier, the G.O.C. [General Officer Commanding] of the Cavalry Division which had gone through us, two aeroplane pilots, one of whose machines had crashed and the other who had made a landing near us and later left in his machine, and several Tank officers of the tanks which had taken part in the engagement. The G.O.C. Cavalry Division stated that the Canadians were the first Infantry troops through which his Division had gone into action at any time. 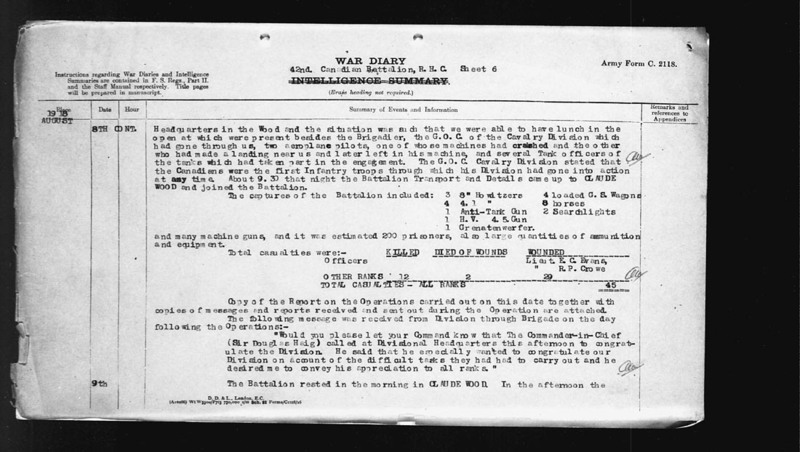 About 9.30 that night the Battalion Transport and Details came up to CLAUDE WOOD and joined the Battalion. and many machine guns, and it was estimated 200 prisoners, also large quantities of ammunition and equipment. Francis was wounded by a gunshot to his right ankle in this engagement and invalided to England, where he spent a month in hosptial. Francis got married while he was recovering in England to Dorothy Florence Kingsnorth in Southwark, Surrey, on December 22nd, 1918. He returned to Halifax on the RMS Aquitania in January 1919 and was demobilized in Kingston on February 18th. In 1921 Arthur and Dorothy were living in Thomas Street, Deseronto with their one-year-old son. Arthur’s parents and siblings were living in Dundas Street in the same census. Arthur died in 1976.